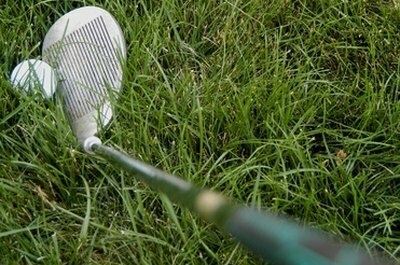 Successful chipping can help lower your scores. Many golfers spend a lot of time improving their full swings so they can hit their drives longer and straighter, but most of them overlook an obvious way to better their scores. There's an axiom: “You can drive for show, but it's how you pitch and putt that makes the dough.” By improving your chipping, you can enhance your game and lower your handicap. Address the ball differently than on other shots. Put your feet closer together and place the ball more toward your back foot. More weight should be on the foot closer to pin. Club selection depends on the distance and how close you are to the green. On pitch-and-run shots, choose a club that will just reach the green and let it run up to the flag. When using a wedge, though, for longer shots or clearing an obstacle, the shot will depend on how much backspin is needed. Keep your hands ahead of the ball from the address to the completion of the shot. Most chip shots should be made with little on no break of the wrist. That will keep you from mis-hitting shots. Think of your arms and wrists as a clock working in unison. Finally, the length of your follow-through should be the same as your backswing and both are determined by how hard you need to hit the ball. Keep your head down throughout the chip, and only look up after the ball is struck and on the way to the hole. To ensure this, count to three before looking up. That can help cure more than half the mistakes golfer's make on chip shots. Practice makes perfect. Besides putting, chipping the golf ball takes the most “feel” of any other golf shot. A good chipper knows instinctively how hard he has to hit the ball to get it close to the pin. And it takes hours of practice to give him that edge.